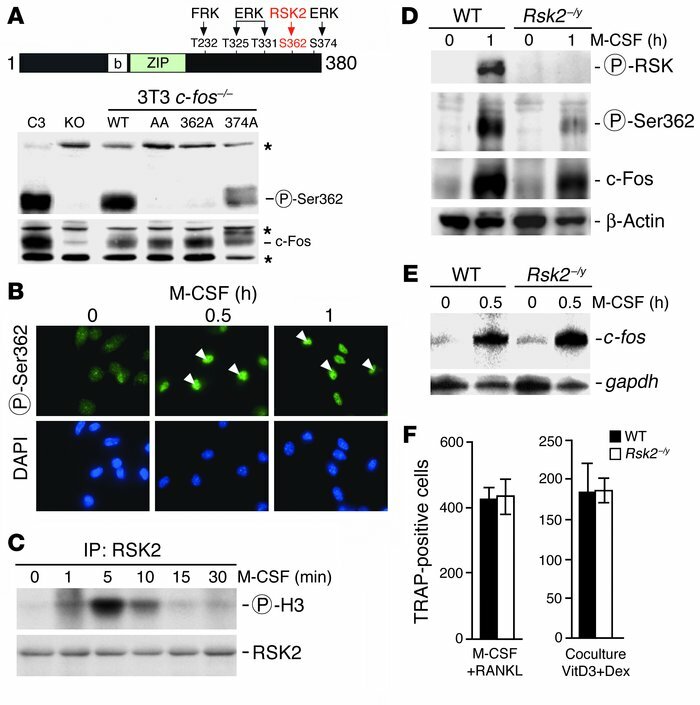 c-Fos phosphorylation by RSK2 is not required for osteoclast differentiation. (A) Characterization of the specific antibody directed against c-Fos phospho–serine 362. The position of the putative RSK2 phosphorylation site in the C-terminal domain of c-Fos is indicated in red. Other proposed phosphorylation sites, kinases that phosphorylate them, and the relative positions of the DNA binding and dimerization domain (bZIP) are also indicated. The following were analyzed by Western blot: c-Fos expression and phosphorylation on serine 362 in c-fos–deficient 3T3 fibroblasts re-expressing wild-type c-Fos (WT) or mutated forms in which serine 362 has been replaced by alanine (362A) and/or serine 374 replaced by alanine (AA and 374A). A c-Fos osteosarcoma cell line (C3) and the parental 3T3 (KO) were used as controls. *Nonspecific reacting bands. (B) c-Fos phosphorylation in M-CSF–stimulated M-BMMs. Immunostaining using the phospho–serine 362 c-Fos antibody. Arrowheads indicate immuno-positive nuclei, visualized using DAPI. Magnification, ×20. (C) RSK2 activation in M-CSF–stimulated M-BMMs. Immunoprecipitation kinase assay using an antibody directed against RSK2 and histone H3 as a substrate. (D) c-Fos expression and phosphorylation on serine 362 in Rsk2–/y M-BMMs compared with wild-type. RSK2 activation was analyzed using anti–phospho-RSK2; β-actin was used as loading control. (E) Expression of c-fos mRNA in M-BMMs lacking RSK2, analyzed by RNase protection assay; gapdh was used as loading control. (F) Left: Differentiation, induced by M-CSF and RANKL, of Rsk2–/y or wild-type monocytes into multinucleated osteoclasts (TRAP-positive cells). Right: Osteoclastogenic properties of calvarial osteoblasts isolated from Rsk2–/y or wild-type newborn littermates were analyzed by coculture with wild-type bone marrow cells stimulated by 1,25-dihydroxyvitamin D3 (VitD3) and dexamethasone (Dex).